Birds: Brain and Behavior is a collection of papers that discusses brain-behaviors problems concentrating on the bird's complex and well-integrated central nervous system. 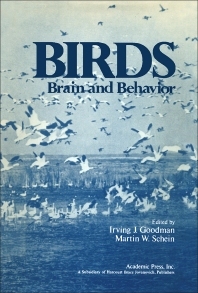 This collection reviews the theoretical and methodological problems concerning comparative studies of bird behavior in a brain-behavior relationship. The book explains the structural organization of the avian brain including the spinal cord and the general ascending/descending patterns of sensory projections. One paper analyzes the hearing and vocalization in songbirds that are composed of the auditory mechanisms, as well as the vocalization and audition systems. A study by Falls (1963) notes that songbirds use more than one type of auditory cue for species recognition. Another paper present brain stimulation parameters that affect bird vocalization. Other papers examine the neural basis of avian discrimination and reversal learning, memory disruptions by brain perturbation, and the behavioral and physiological correlations between the sleep and awake states. This book will prove useful for avian biologists, zoologists, and readers who have a general interest in birds. II. Which Animals Shall We Compare? III. What Shall We Compare?